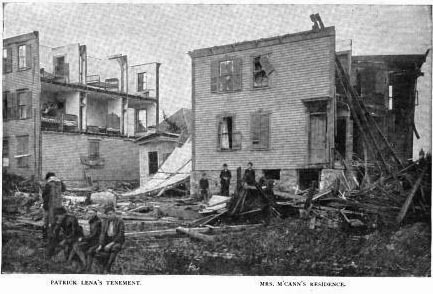 On a summer morning in July 1890, the cyclone hit Lawrence, Massachusetts suddenly and without warning. What we would today call a tornado or microburst began as soft showers advancing across the city as people made their way to work on Saturday, July 26, 1890. As nine o’clock approached, the clouds thickened and darkened the sky. The rain intensified. Fifteen minutes later, a funnel cloud appeared in the skies above Lawrence. The wind picked up. Then, the noise started. Later, survivors learned that those sounds were nearby houses being torn apart. Most Lawrence residents confused the commotion for noise coming from the city’s textile mills or from the city’s busy streets. Chaos emerged as they realized a cyclone was crashing down onto South Lawrence, sending trees, houses, and other debris flying through the air and across the city. In just three minutes, twenty-five houses were completely destroyed. Another 25 received serious damage. Dozens of people were wounded, and eight people lost their lives. The cyclone struck Lawrence just west of Broadway, a main route connecting the city with Andover. The houses on the west side of Broadway escaped with minor damage and downed tree limbs. 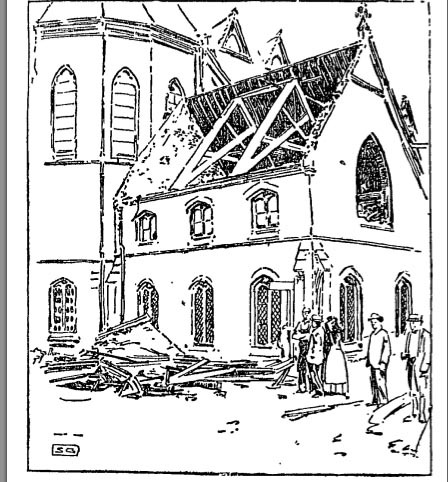 St. Patrick’s Church, the Catholic Church at the corner of Salem Street on Broadway’s east side, wasn’t so lucky. It suffered broken windows and a lost roof on one of its transepts. Far worse, though, was the damage to the neighborhoods off Broadway. Among the first casualties of the 1890 Lawrence cyclone was the saddest. Mary Lyons, 24, was outside as the cyclone approached her Emmet Street home. Fearing for her child, she ran inside her home just moments before the winds dashed her house from its foundation and broke it apart. Her husband, James, was just a few feet further away, in a neighboring field, and just steps behind his wife. The winds proved too much for him and he was blown aside, never reaching the house. Outside, pinned to the ground just feet from his home, he was forced to watch it break apart with his family inside. When the winds died down minutes later, he regained his footing, ran for his home and, with other rescuers, found the body of his wife, with a beam that had fallen across her forehead. As they pulled her from the wreckage of the house, they found the Lyons’ young daughter underneath her, very alive and clasping her mother’s body while crying “mamma, mamma”. The cyclone next crossed Salem Street’s overhead railroad bridge where Michael Higgins, who was working the bridge’s switch house, was blown more than 150 feet away. His body was later found with a broken neck. He was 23. The winds next hit the house of Deacon William Cutler, who lived on the corner of Salem and Blanchard Streets. The four people in the house at the time survived with just minor injuries. One daughter narrowly escaped death by hiding under the family’s piano. Another of Deacon Cutler’s daughters, Helen, just 11 years old, wasn’t so fortunate when she was carried down an embankment by the cyclone and struck by debris. She died a few hours later. 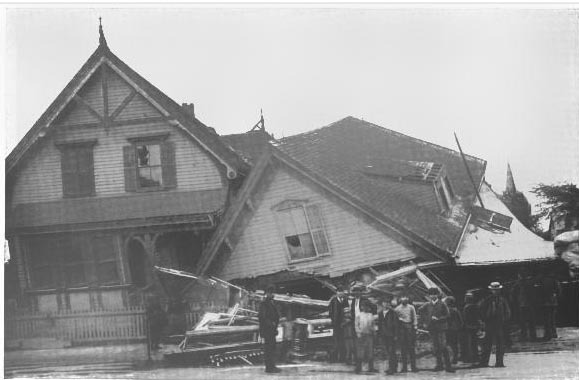 Soon after the cyclone bore down on the Cutlers’ home, the wind shifted, sending the cyclone spiraling toward Springfield Street, where the heaviest devastation was recorded. The houses there were either torn down entirely, blown over on their sides, or had entire walls torn out. There, Elizabeth O’Connell, 32, died when she was crushed to death by the debris of her collapsing house. Her eleven-year-old daughter, Mary Ann, affectionately known as Mamie, died with her. After Springfield Street, the cyclone flattened a grove of trees on Union street, before demolishing another six houses on Portland Street. On Portland Street, among the debris, Elizabeth Collins and her six-year-old daughter, Annie, were found inside their house. Hannah Beatty, 10 years old, was also found nearby. All died of suffocation after being trapped under debris. Some stories of miracle cases were told where death had been averted. A bundle of rags blowing down Springfield Street in the aftermath of the cyclone turned out to be the baby daughter of Mrs. Elizabeth O’Connell, covered in dust and plaster, but otherwise unharmed. Another Springfield Street resident, Mrs. Lizzie Holdeworth, was sitting in her house as the winds bore down upon South Lawrence. She heard a crash, but lost consciousness before she could react. When she came to, she was trapped under a pile of beams, unable to move, or to even make a noise. A rescuing party, arriving hours later, chopped her free. The names of the eight victims of the 1890 Lawrence, Massachusetts cyclone, as recorded in the municipal death records. In the aftermath of the cyclone, Lawrence set upon the ruined district around Springfield Street and started clearing the debris, and planning funerals for the dead. Half of the cyclone’s victims were parishioners of St. Patrick’s Church. Owing to the fact that cyclones are somewhat rare in the New England region, thousands of sightseers were reported to have descended upon South Lawrence in the days following the cyclone to view the damage. Many remarked that the loss of life was very low for such a damaging storm. This, of course, was no solace to the family and friends of the eight victims who lost their lives during the Lawrence Cyclone of 1890. The destructive power of wind. I have not personally been in a tornado, but have seen the path of destruction left by several of them. As a Springfield, MA resident, the lingering devastation of the 2011 tornado is all too fresh in my mind. After reading about the death toll in Lawrence, I think modern building codes saved many lives. Sad, sad story. 😦 We were narrowly missed by a tornado several years ago, it was quite an experience.